This PHTLS Provider shirt will show all your EMS professional friends you proudly completed the NAEMT PHTLS course. 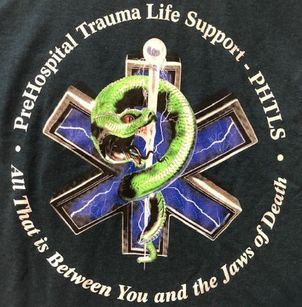 The Star-of-Life with embedded lighting, with the Rod of Asclepius (Greek Symbol of Healing), with the Snake 3D entwined around it, has the perfect saying "PHTLS - All that is between you and the jaws of death"
This AMLS Provider shirt will show all your EMS professional friends you proudly completed the NAEMT ALMS course and have training in knowing those 'RED' flags overlooked in medical situations. 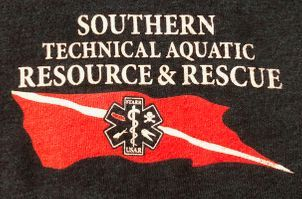 The Star-of-Life with embedded lighting, with the Rod of Asclepius (Greek Symbol of Healing), with the heart rhythm in the background, has the perfect saying "AMLS - Treating Those in Need Because Failure is Not an Option"
This TCCC Provider shirt will show all your EMS professional friends you proudly completed the NAEMT TCCC course. Show off that your specialized skill set in Tactical Medical training that is used in both the ERT / SWAT Law Enforcement as well as Combat Operations. The Star-of-Life with into a SWAT symbol with the Eagle carrying weapons, with the Rod of Asclepius (Greek Symbol of Healing) is portrayed as a sword, has the perfect saying "TCCC PROVIDER - Giving Good Medicine in Bad Places"
This EPC Provider shirt will show all your EMS professional friends you proudly completed the NAEMT EPC course and have a much better understanding on how to treat those pediatric patients in medical situations. The Star-of-Life with embedded flames, with the Rod of Asclepius (Greek Symbol of Healing), has the perfect saying "AMLS - Treating Those in Need Because Failure is Not an Option"
This AHDR Provider shirt will show all your EMS professional friends you proudly completed the NAEMT AHDR course and understand how to respond to both natural and man-made disasters, how to analyze potential threats, assess available resources, and create basic response plans. The unique symbolize portrays the various type of disasters that you as Public Service Professional may face within the blowing winds of a tornado which has the perfect saying that is used with the Emergency Management profession "AHDR - Preparedness Through Training So Not To Learn Through Tragedy"
This TCCC Instructor shirt will show all your EMS professional friends you proudly completed the NAEMT TCCC course as well as the Instructor Course. It will show all that not only do you know a highly specialized skill set in Tactical Medical but teach others that valuable specilized training used in both the ERT / SWAT Law Enforcement as well as Combat Operations. The Star-of-Life with into a SWAT symbol with the Eagle carrying weapons, with the Rod of Asclepius (Greek Symbol of Healing) is portrayed as a sword, has the perfect saying "TCCC INSTRUCTOR - Giving Good Medicine in Bad Places"
This shirt will be the envy of all your female friends as it not only shows confidence in your abilities but also in your self. This humorous shirt is perfect for those in EMS and will be great for everyday. The Star-of-Life with embedded flames, with the Rod of Asclepius (Greek Symbol of Healing), with the heart rhythm in the background as has the perfect saying "Just Cute Enough to Stop Your Heart - But Skilled Enough to Restart It Again"